Bail Bonds Oahu: Are You New to Honolulu? So you’ve made the (probably not all that) difficult decision to move to Honolulu. 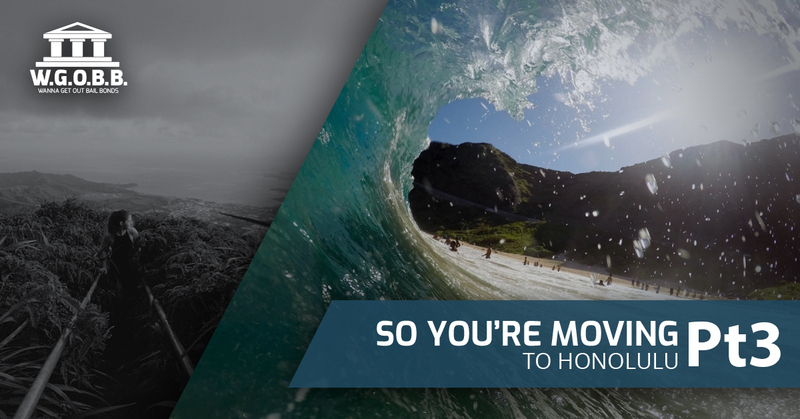 Sure, there are plenty of really important things to consider before making a big move, but trust us when we say that the second you set foot on Oahu, you’ll be convinced that this is where you’re supposed to be. From the many great instances of natural beauty to the amazing food to the friendly community on the island, you’ll love the time you spend here. Please allow the team at Wanna Get Out Bail Bonds to be among the first to welcome you to your new home. As you’re probably well aware, there’s a whole lot to do here. No matter what your hobbies are, you can get lost in the many options of things to do on this island alone. Not to worry though. We’ve shared a few ideas for things to try on Oahu in part one and part two of our series, and in this final installment, we’ll be wrapping it all up with some real doozies. What we mean by that is that as much as you’re sure to love what came before, we think we’ll knock your socks off in the grand finale. Would it be too dramatic to say that it’s all come down to this? Perhaps, because the truth is that you can always find something fun to do here. All we’re saying is that if you’re not sure what to start with on Oahu, this list should give you some pretty good ideas. So without further ado, let’s take a look. The Kapi’olani Community College Farmers Market is a great one-stop shop for everything that’s great about Hawaii. Do you enjoy locally and sustainably grown foods? How about insanely delicious baked goods? Maybe freshly roasted coffee beans are up your alley. Whatever you appreciate the most, you’re sure to find at at the KCC Farmers Market. It doesn’t get much better than a market where “the farmers and food producers are in attendance to tell you about their products, how they grow them, and how you should prepare them.” From beautiful local flora to unique restaurants to seasonal snacks, you’ll find it all and more during a stroll through the Farmers Market. One of the best parts about spending time in Honolulu is exploring the restaurants and trying the foods. As a “dinner-only culinary destination features Iron Chef Morimoto’s iconic cuisine that seamlessly integrates Western and traditional Asian ingredients with unmatched creativity and innovation,” Morimoto Asia is unlike anything you’ve had before. With a menu that includes spicy tuna tacos, fish carpaccio, tuna pizza, surf and turf sushi rolls, popcorn shrimp tempura, kung pao chicken, angry lobster, wok sauteed vegetables with tofu, and more, you’re sure to find something to satisfy pretty much any craving you’ve had. And probably create more cravings for the future, if we’re being honest! Be sure to enjoy some sake and dessert as well. No matter what you have, you’re sure to find that you’ll eat the meal of a lifetime at Morimoto Asia. For this recommendation, we don’t have a specific place in mind. Instead, all we’ll suggest is that you find a place to get a lomi lomi massage. If you’ve just moved here, chances are that you’re still carrying some stress around in your body. This is to be expected! Thankfully, a lomi lomi massage is the perfect solution. Our advice is to do a bit of research and find the massage therapist that sounds like the best fit for you. Just like others types of massages, lomi lomi massages are different from person to person. Either way, when you need to get rid of stress and tension that come with a move to a new location, this is one of the best ways to do it. Whether you’re heading out for an underwater adventure by yourself or you’re bringing the entire family along for some fun, snorkeling offers a unique perspective of life in Honolulu. All you need is a swimsuit, a towel, and some reef-safe sunscreen and you’re sure to have a blast. When you’re done, you can even swing over to the snack bar to grab a bite to eat. Does it get any better than that? Here’s the deal — we recommended some of the best things to do if you’re new to the island, and we have no doubt whatsoever that if you do them, you’ll have the time of your life. Unfortunately, you have to take the bad along with the good sometimes. At the end of the day, the reality is that sometimes bad things happen when you least expect them to. Kind of like when you get a phone call in the middle of the night to let you know that your loved one has been arrested. Thankfully, the team at Wanna Get Out Bail Bonds on Oahu is here to lend a helping hand no matter the time of day or night. Regardless of the specifics of your situation, you can count on us to be there for you when you need help the most. If you’re new to the island, you already have plenty to learn; who has time to figure out the ins and outs of the legal system as well? Not to worry though, because we have you covered. With free bond advice as well as flexible payment plans, we’re the team to turn to when you’re in need of help on Oahu. Contact us today to get the help you need.